2. Boost Traffic Contests are a great way to increase your Facebook likes. Why? Contests are a marketer’s dream in some ways. They provide an exciting event, with a limited time frame. A limited time frame creates scarcity. Scarcity is a great way to generate motivation in a consumer. You can also create scarcity by offering a limited number of prizes. Observing this first hand, it is really quite amazing how excited people can get about a whole myriad of products when limitations are set. 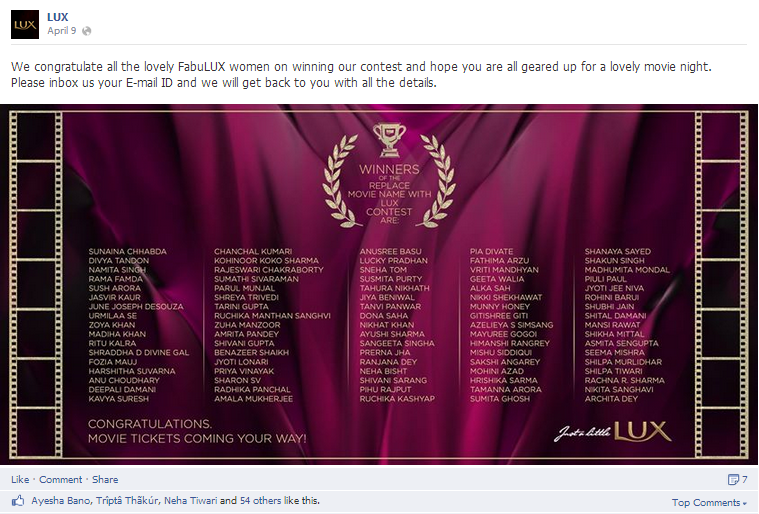 A brilliant example of boosting traffic we has been observed at LUX’s Facebook Page. They run weekly facebook sweepstakes, giving away – movie tickets. With 4,834,829 Likes (and Counting) Lux is growing exponentially and maintaining a healthy PTAT ratio. 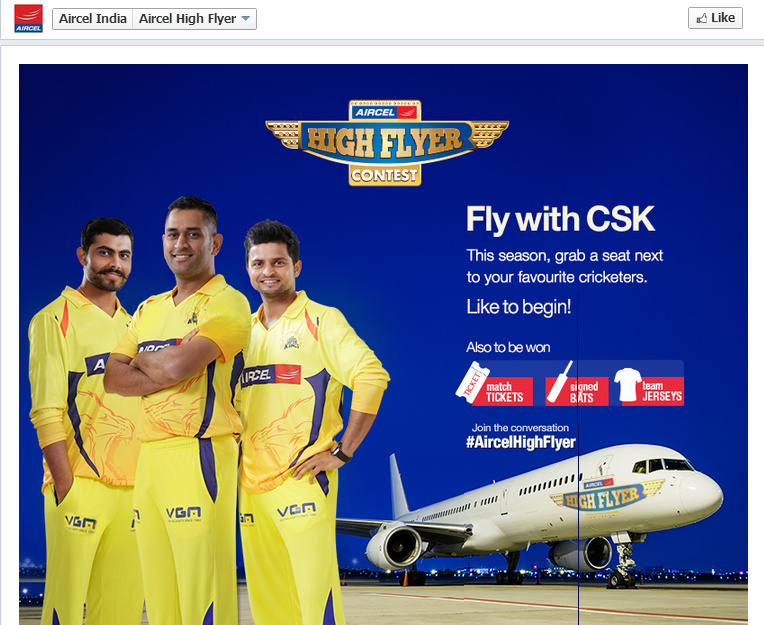 They manage to get healthy attraction on their contests by creating a pre-buzz about it. 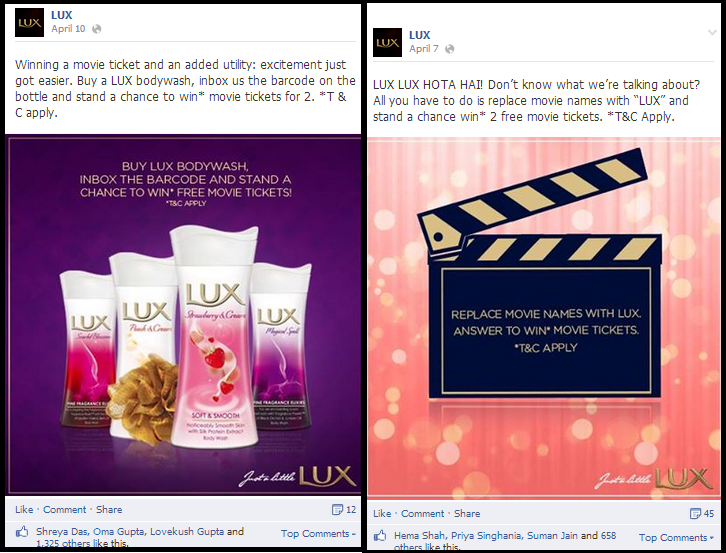 This is brilliant marketing, using Facebook contests to increase traffic, and drive sales. 3. Produce User-Generated Content Facebook contests, like Photo Contests, Video Contests and Essay contests can produce valuable user-generated content (UGC). What is ugc? User-generated content is content that is created and uploaded by your users, or Fans. Let’s take a photo contest, for example. 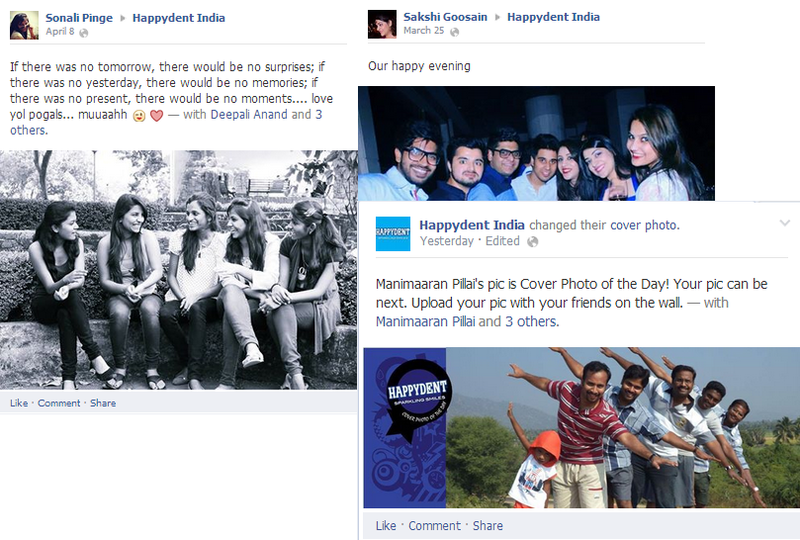 Happydent India hosts photo contests on their Facebook page. Happydent is India’s leading coated gum which is available in a Mono format. They are continuously running their ‘Sparkling white contest’ where they invite fans to post pictures on their wall and out of the posted picture, at random a picture is declared as winning entry and being made the cover page of the page. Earlier Happydent used to give the winner a Mug with the photo imprinted upon it. 4. Increase Sharing and Virality An ultimate goal of any great social media marketing plan is get your campaign shared and to go viral. This is not so different than marketing campaigns of old. The more your marketing campaign is shared – whether through word of mouth or various forms of media – generally, the better your success. Social media is all about sharing. With interactive Facebook content like contests, Facebook sweepstakes and group deals, your brand can get shared – a lot. Create a contest that is relevant to your brand, has an element of fun or excitement, and gets your community interested. Make it easy and fun to engage. Your consumer will share it. In most of third party apps, once a contestant enters, a post is automatically sent to their Facebook wall, which spreads your contest to friends of your fans. Friends of your fans are likely your target market too, as they are friends and share some interests. This makes your contest have the very real potential to go viral. 5. Generate Conversations Contests create dialogues between your business and your consumers. Contests on Facebook make is easy to get friends talking to friends about your brand. The expression ‘word of mouth’ rings very true in social media. Facebook is a place where friends go to talk to each other. Create an interactive contest with, make it authentic, make it resonate, and you will be talked about. All kinds of businesses, from multi-million dollar productions to the local mom-and-pop shop are realizing the benefits of running Facebook contests. 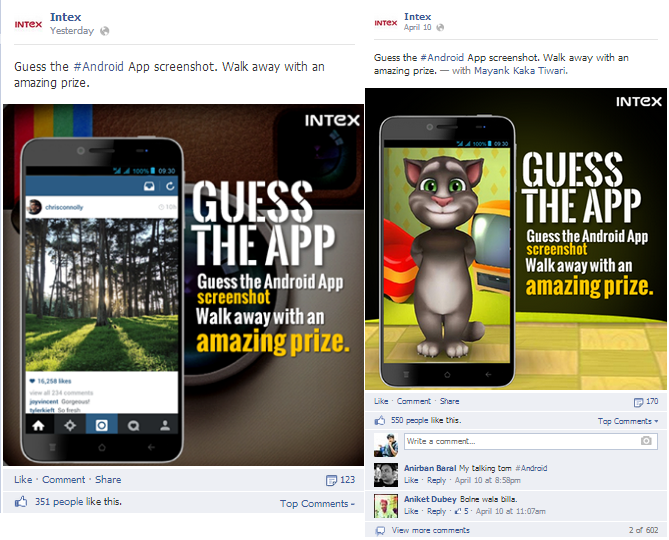 Below is an example of the Intex ‘Android App Screenshot’ Contest. The more interactive your posts are on Facebook, the more conversations they will garner. Contests hit the mark on generating interactive content. 6. Grow your Email List Contests can create engagement long after the excitement has passed. Collect entrants’ emails, or “email-gate” your Facebook sweepstakes. A good third party contest app, enables you to easily see and categorize all of the emails you collect.